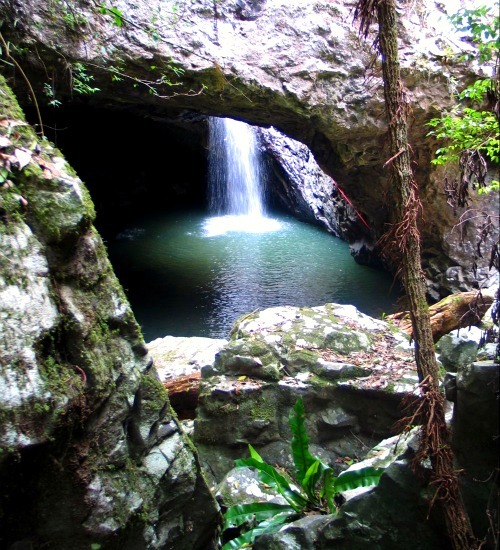 Natural Bridge in South East Queensland, Australia is a stunning combination of sculptured landforms and lush green rainforest. There’s a short circuit walk that takes you past strangler figs, palms and high in the canopy birds nest ferns down to Cave Creek where years of water erosion has resulted in water falling down into a cave through its basalt roof. At night the ‘fairy lights’ of glow worms can be seen. This entry was posted in Australia ~ Photo, Australian - Landscapes and tagged australia, australia_outback, landscape, natural_bridge, rainforest, travel by Linda. Bookmark the permalink. Oh, lovely photo. 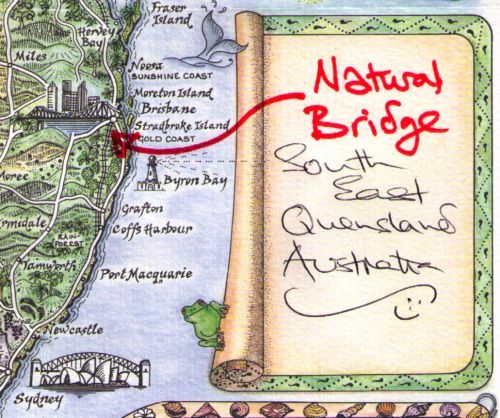 Natural Bridge is on my list, but I haven’t had the chance to make it out there yet. Haven’t been there for ages. It would be spectacular after all the rain. Must visit again soon – thanks for the reminder. I love the Strangler fig near the top, the walk through the rainforest vegetation and then the beautiful river pouring through into this cave.